There are 458 Irish personnel attached to Unifil. Minister Kehoe handing out the medals. IRISH DEFENCE FORCES members have been honoured for their peacekeeping roles in south Lebanon at a special medal ceremony. In all, 147 members of the 113th infantry battalion were recognised for their service with the United Nations Interim Force in Lebanon (Unifil). 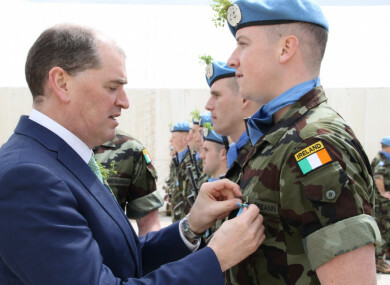 To reflect the sizeable Galwegian contingent among the personnel stationed there, one of the main areas in the Unifil camp was renamed Connemara Square following the medal parade. The Unifil mission was set up in 1978, following the invasion of Lebanon by Israel. Since 2000, following the Israeli withdrawal, Unifil has continued to operate in the region. Irish personnel stationed there, under the command of Lieutenant Colonel Caimin Keogh, patrol, monitor and report on developments in the area. They also correct violations of the so-called Blue Line – the border demarcation with Israel – and prevent the escalation of incidents. There are 458 Irish personnel attached to Unifil, and a decision was made to increase its contribution by 106 troops last November. Speaking at the ceremony, Minister with responsibility for defence Paul Kehoe said there was an affinity between the Irish Defence Forces stationed there and the local community. The minister added that he was aware of the sacrifices the troops made, given they were unable to celebrate St Patrick’s Day at home with their families. He added that the government is proud of them. Email “Defence Forces personnel recognised for their role in south Lebanon at special ceremony”. Feedback on “Defence Forces personnel recognised for their role in south Lebanon at special ceremony”.